Happy St. Patrick's Day! For every holiday, my office has a potluck lunch to celebrate. For St. Patrick's Day I wanted to try something new. My boss asked if somebody would make shortbread cookies so I volunteered. But of course I couldn't just make shortbread cookies, they needed to have something extra. Keeping with the spirit of St. Patrick's Day I decided to incorporate Irish Cream. 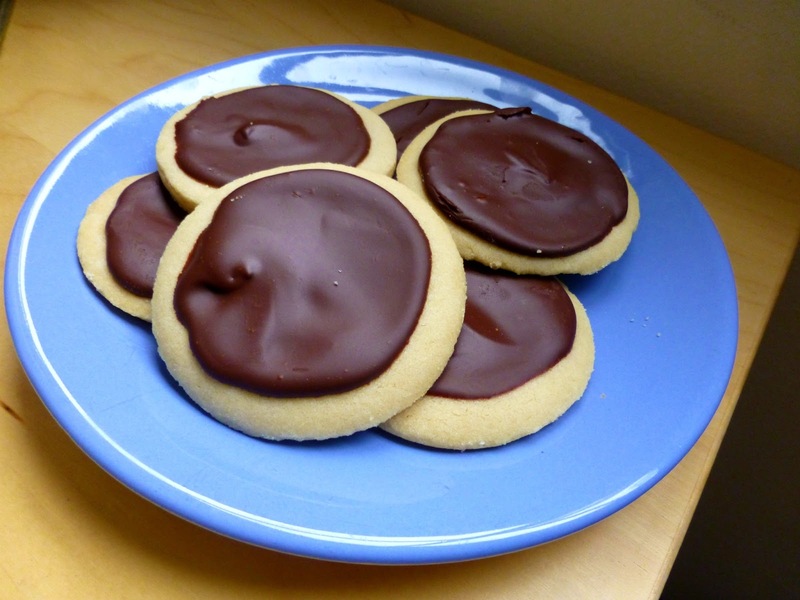 After pondering my options for a few days I came up with shortbread cookies with a dark chocolate Irish Cream ganache. 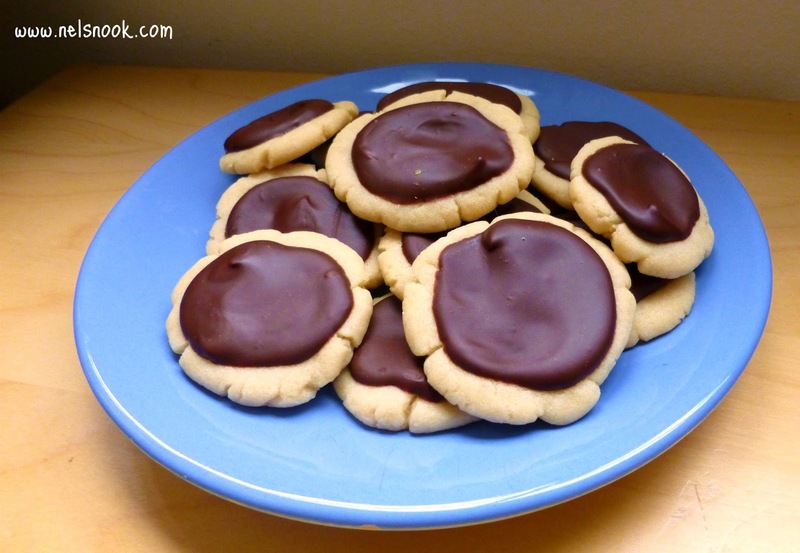 The buttery cookies and rich chocolate topping go beautifully together. I also discovered that they are good fresh but if you try them the next day they are amazing! Using a mixer, cream together the butter, sugars, and vanilla. Slowly add the flour. Mix until the dough forms a ball. Next, roll out the dough into a 1/4 sheet and cut into shapes using cookie cutters. For a more rustic looking cookie create 1" balls of dough with your hands and flatten. Place the cookies on baking sheets lined with parchment paper. Bake the cookies for about 15 minutes or until they are no longer doughy in the center. These cookies will not brown up so keep a close eye on them - you do not want to over bake them. Put the chocolate and milk in a microwave safe bowl. Microwave for 30 seconds at a time at 50% power. Stirring in between 30 second intervals. Continue until chocolate is completely melted. One at a time, add 1 tablespoon of Bailey's Irish Cream Coffee Creamer until completely incorporated. Continue adding Irish Cream until the flavor suits your taste - I used 8 tablespoons. Once the cookies have completely cooled spread a large spoonful of the chocolate glaze onto each cookie and spread it over the entire cookie. The cookies can be eaten right away but I highly suggest letting the cookie and chocolate meld over night - you will not be disappointed! I just left my sitting out on parchment paper over night and then put them in a container the next day. They were soft, buttery, and chocolatey - AMAZING! Happy early St. Patrick's Day - how do you celebrate St. Patrick's Day? Oh my gosh, that ganache is just beautiful! Love this! Thanks so much for entering the cookie contest! 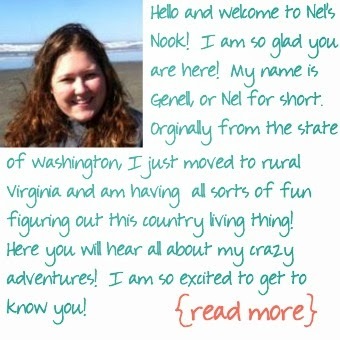 Thank you Karly and thank you for hosting such a fun contest! St. Patrick's Day (on March 17th, each year) is celebrated in New Orleans and its suburb in the form of....another parade! It's the perfect season for another celebration ... after all, it's New Orleans, and we love to parade!